The use of flavonoids for prevention and cure of human diseases is already widespread. Quercetin shows anti­proliferative effects against various cancer cell lines. These aspects made flavonoids an interesting object for industrial production. This paper describes a plant-cell-culture production approach that provides increased yields of flavonoids. Cell culture of Astragalus missouriensis was established, and flavonoid production was determined and optimized. The chemical investigation of cell extracts led to the isolation of different flavonoids by means of HPLC and TLC. The main aglycon identified was Quercetin in both free and bound forms (as glycosides). Isoquercitrine (quercetin-3-0-glucoside) and Quercitrine (quercetin-3-0-rhamnoside) were the main flavonoid glycosides in all tested cell lines. 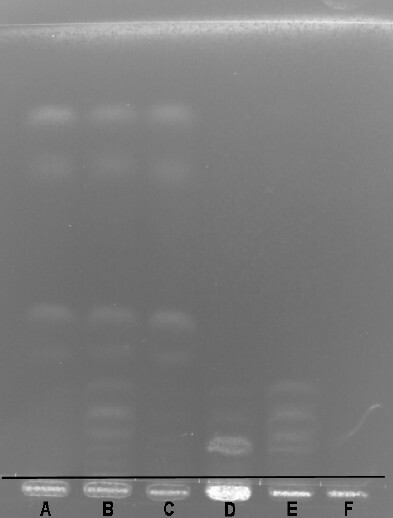 Rutin (quercetin-3-0-rutinoside), Hyperoside (quercetin-3-0-galactoside), Scopoletin and Phenolcarbonic acids - p-coumaric and chlorogenic have been also detected. In order to increase flavonoid production in vitro the effect of plant growth regulators (auxins and cytokinins) and sucrose concentration were examined. Content of flavonoids was severally decreased in higher concentrations of 2,4­dichlorophenoxyacetic acid (2,4-D). Addition of cytokinin stimulated both proliferation and flavonoid production. Kinetin was favorable for flavonoid production in A. missouriensis cells. After optimization of production medium maximum total amount of flavonoids 1.34% was achieved. 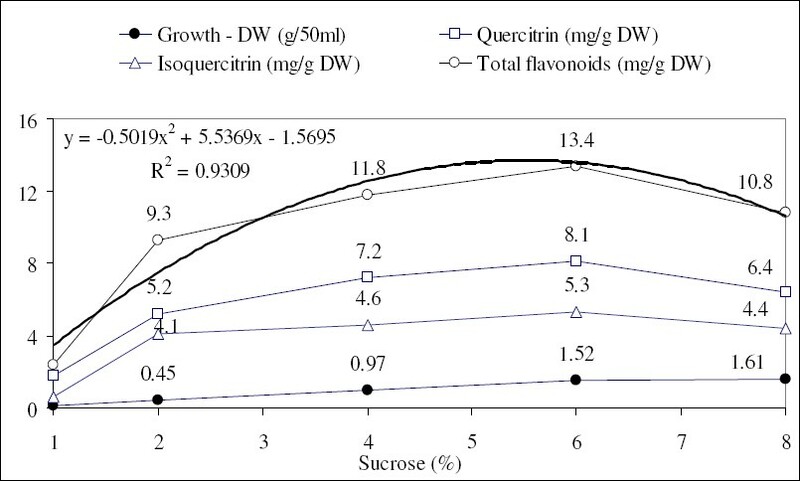 The highest amount of Isoquercitrine (5.3 mg/g DW) and Quercitrine (8.1 mg/g DW) was found in medium with optimal combination of growth regulators naphthaleneacetic acid (NAA) I mg/l, Kinetin 2 mg/l and 6% (w/v) sucrose. Rapidly growing cell lines were selected to increase the efficiency of the production of Quercetin derivatives. These results could provide a practical means of in vitro cultivation of this medicinally important plant and for further biotechnological applications. The hemi-parasitic plant Dendrophthoe falcata (L.f) Ettingsh (Loranthaceae) of the order Santalales, is used ethnomedicinally for treating ulcers, asthma, impotence, paralysis, skin diseases, and wounds. The aerial parts are also used in menstrual troubles, psychic disorders, pulmonary tuberculosis, consumption and mania by the tribal of India. In this context, the plant requires the validation of any potential toxicity before therapeutic promotion. The aim of the present study was to evaluate the neurobehavioral toxicity of the hydroalcoholic extract from D. fatcata growing on the host plant Azadirachta indica, after subacute exposure. 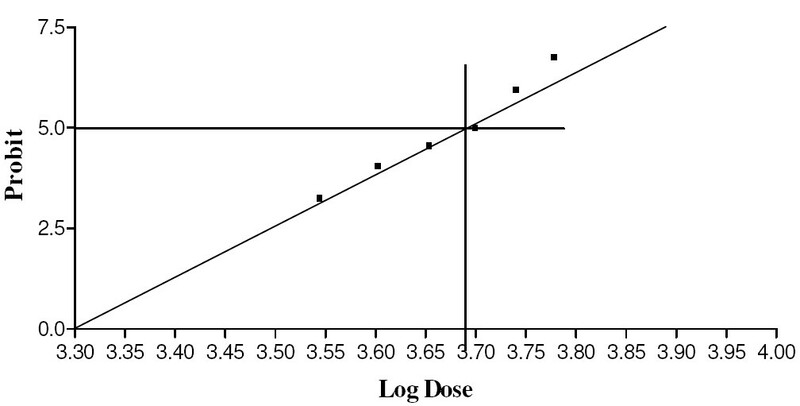 The LD50 was assessed in female wistar rats and was found to be 4550mg/kg by oral route. The plant extract was administered in three different doses i.e. 250mg/kg, 475mg/kg and 950mg/kg body weight/day for a period of four weeks. At the end of the exposure, behavioural and functional parameters were assessed in a functional observational battery (FOB) and motor activity was measured in an open field. A decrease in the arousal level was observed in experimental groups. Also, the total number of urine spots increased in a dose dependent manner for extract treated groups. Our results suggest that hydroalcoholic extracts from aerial parts of D. falcata should be relatively free from any serious neurobehavioral toxicity and safe to use. Twenty seven extracts from eight medicinal plants used in Morelos, Mexico, for the treatment of several infectious diseases were screened for their in vitro anti-Mycobacterium tuberculosis (anti-MTB) activity on H37Rv strain of Mycobacterium tuberculosis (MTB), using the microplate Atamar assay test. Extracts (hexane, dichloromethane and methanol) from wild specimen of Valerians edulis showed the most significant (p<0.05) activity against this strain (MICs values of 3.125, 25.0 and 50.0 μg/mL, respectively). On the other hand, hexanic and dichlorometanic extracts from in vitro-cultivated species of V. edulis also showed significantly activity against of M. tuberculosis (MICs values of 12.5 and 50.0 μg/mL, respectively). Most active extract (hexanic) obtained from V. edulis was also assayed against the drug-resistant strain (CIBIN 99), and the MIC value was 50 μmL. A qualitative TLC analysis of extracts from wild and in vitro-cultivated species of V. edutis showed that both content different chemical constituents. So, this last result explains the difference between anti-MTB activities of the extracts. Finally, dichloromethanic extracts from Lepechinia caulescens also showed a significantly activity against of M. tuberculosis (MIC 100 μglmL). In conclusion, V. edutis and L. caulescens hexanic extracts are sources for the isolation of new or known compounds that could be used as leads for development of potential anti-MTB drugs. The effect of Azelain isolated from Rhododendron dauricum Linn. (Ericaceae) on gastric acid secretion in rats was investigated at a dose of 40 mg/kg, while its anti- inflammatory effect was investigated in two experimental models: arthritis induced by Freund's adjuvant carrageenan and cotton pellet induced granuloma. Azelain did not inhibit gastric acid secretion, suggesting that its anti ulcerogenic effect can be attributed to its action on the mucosa defense factors. On the other hand, Azelain inhibited both chronic and acute adjuvant carrageenan induced inflammation phases, being most effective in the chronic phase. In the granuloma test, Azetain also inhibited inflammation. It is suggested that the anti inflammatory activity of Azelain may be attributed to interference with multiple targets on the level of transcription factors, such as NF-kB and cytokines. This study examined the antidiarrhoeal potential of Sri Lankan black tea (Camellia sinensis) in mice using high grown unblend Dust grade No: 1 tea. Different concentrations of black tea brew (BTB) [84 mg/ ml (equivalent to 1.5 cups), 167 mg/ ml (equivalent to 3 cups), 501 mg/ ml (equivalent to 9 cups) or 1336 mg/ ml (equivalent to 24 cups)], or a high concentration (equivalent to 9 cups) of green tea brew (GTB) of Chinese and Japanese types or reference drug, toperamide (10 mg/ kg) were orally administered to different groups of mice (N = 9-12/group) and were subjected to two antidiarrhoeal tests: normal defecation test and castor oil-induced diarrhoea test. The results show that BTB of Sri Lankan Dust grade tea dose-dependently and markedly decreased the number of faecal boluses produced in the normal defecation test and improved the severity of the diarroheal condition in the castor oil-induced diarrhoea test. However, the antidiarrhoeal effect of BTB was superior to Japanese type of GTB and inferior to loperamide. BTB also prolonged the gastrointestinal transit time, impaired intestinal fluid secretion, increased intestinal fluid absorption and reduced in vitro nitric oxide production. It is concluded that Sri Lankan black tea possesses marked antidiarrhoeal activity supporting the folkloric claim that Sri Lankan black tea is a good remedy for acute non specific diarrhoea. Current research into free radicals has confirmed that foods rich in antioxidants play an essential role in the prevention of many diseases. The potential antioxidant activities of Diospyros lotus and Pyrus boissieriana fruits investigated employing six in vitro assay systems. IC 50 for DPPH radical-scavenging activity was 1.45 ± 0.03 for D. lotus and 3.0 ± 0.04 mg ml -1 for P. boissieriana, respectively. The extracts showed weak nitric oxide-scavenging and Fe 2* chelating ability activity. The D. lotus extracts was better than P. boissieriana. 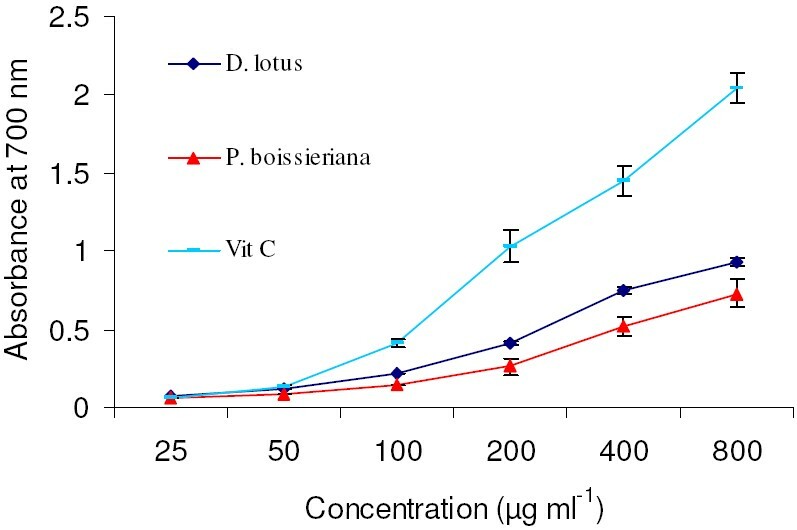 The peroxidation inhibition of D. lotus and P. boissieriana extracts exhibited values from 89 (at 24 th ) to 94% (at 72 nd hrs) and 91 to 95% respectively. Neither of them showed good scavenging activity of H 2 0 2 . The total amount of phenolic compounds in each extracts was determined as gallic acid equivalents and total flavonoid contents were calculated as quercetin equivalents from a calibration curve. Both of them had high total phenolic and flavonoid contents. Many herbal remedies individually or in combination have been recommended in various medical treatises for the cure of different diseases. In the search of natural hypoglycemic agents as alternatives to synthetic ones and to justify the use of Syzygium cumini seeds in folklore system of medicine for diabetes, the hypoglycemic and hypolipidernic activity of Syzygium cumini seeds were investigated in normal and non insulin dependent diabetes mellitus (NIDDM) rats. Diabetes was induced by streptozotocin in neonates. Administration of petroleum ether, chloroform, acetone, methanol and water extracts of Syzygium cumini seeds (100 mg/kg, p.o.) for 21 days caused a decrease in fasting blood sugar in diabetic rats (FBS). Among all the extracts methanol extract was found to lower the FBS significantly in diabetic rats. 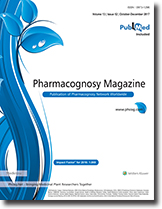 Glibenclamide at a dose of 5 mg/kg p.o was used for comparision. Methanol extract was subjected to column chromatography which led to the isolation of an active principle, which was given trivial name Cuminoside. Cuminoside (50 mg/kg, p.o.) caused significant reduction in fasting blood sugar in diabetic rats. Further it also caused a significant reduction in cholesterol, triglycerides, low density lipoprotein (LDL), hepatic enzymes such as aspartate aminotransferase (AST), alanine aminotransferase (ALT), lactate dehydrogenase (LDH) level and improvement in the level of high density lipoproteins (HDL) in diabetic rats. Reduction in the fasting blood sugar, normalization of liver enzymes level and improvement in the lipid profile by Cuminoside indicates that Cuminoside has cardio protective potential with antidiabetic activity and provides a scientific rationale for the use of Cuminoside as an antidiabetic agent. Trigonella foenum-groecum L. is directly related to the traditional use. Trigonella foenum-graecum L, have been reported to be beneficial for treating type 2 diabetes (T2D). The study was conducted to investigate the postprandial hypoglycemic effect of fenugreek seeds on patients with T2D. Pretest - posttest control group design was used to test the hypothesis that fenugreek may have a hypoglycemic effect on blood sugar. One hundred sixty-­six D2T patients were assigned into three groups: FGO (control group: placebo drink), FG2.5 (2.5g of fenugreek), and FG5 (5g of fenugreek). Participants were instructed to drink the extract and chew the seeds. Postprandial plasma glucose level was measured before and 2-hours after the administration of the treatment. Accounting for gender, age, education, physical activity, body mass index, glycemic control, and medication, patients in FG5 group showed the greatest decrease in postprandial glucose with a pretest-posttest difference (D) of - 41 ± 6.1 mg/dl. 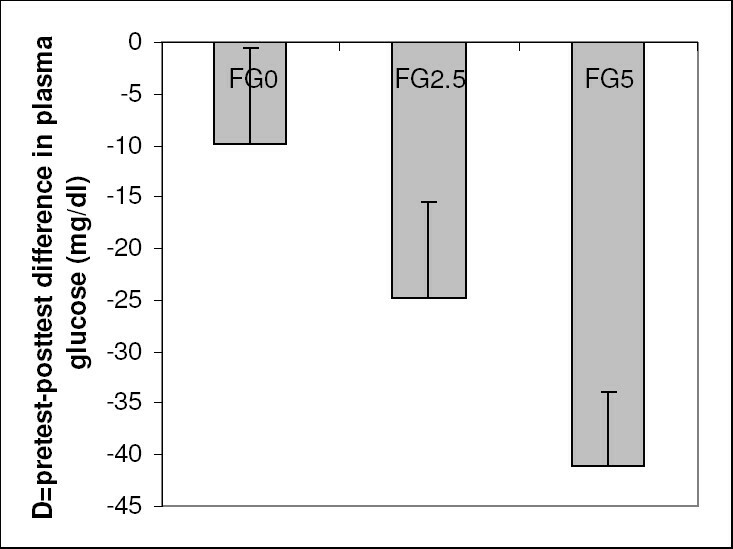 Two-hour plasma glucose dropped for patients in FG2.5, however, the drop was not statistically different from that noticed in the placebo group (D = - 24.8 ± 4.9 mg/dl vs. - 9.8 ± 2.2 mg/dl respectively). Fenugreek seeds appear to have a significant hypoglycemic activity in T2D patients. Organic volatile impurities (OVIs), residual solvents in herbal formulations and extracts were monitored using gas chromatography (GC) with Flame Ionisation detector (FID). As per GMP, measuring residual solvents is mandatory. It is now possible to take advantage of GC equipment with faster temperature ramping capabilities, in combination with shorter capillary GC columns, to achieve considerable gain in efficiency and reduction in analysis time. In the present study Gas chromatographic method for the determination of methanol, ethanol and isopropyl alcohol at residual levels in herbal formulations and extracts was developed using a flame ionization detector and the separation was carried out on BP 624 column, using GC 17 A shimadzu, with nitrogen as carrier gas in the split mode by direct injection method. The retention time for standard methanol, ethanol and isopropyl alcohol was found to be 3.72, 5.26 and 6.28 min respectively. 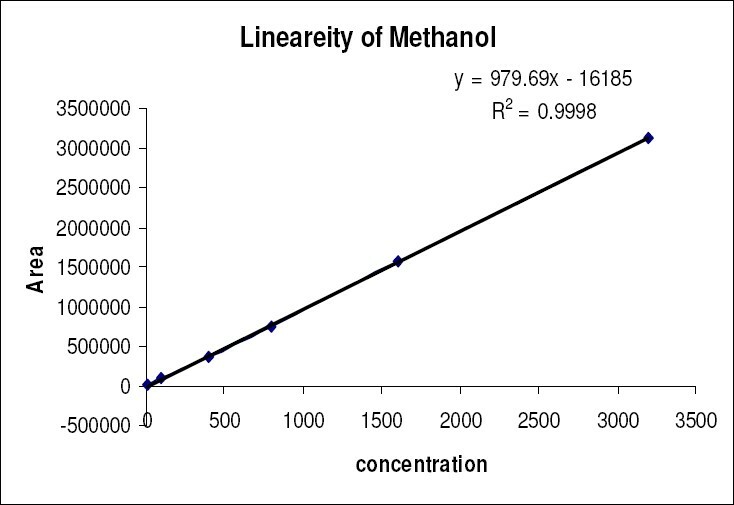 The linearity for methanol, ethanol and isopropyl alcohol (IPA) was found to be in the range of 10-400 μL mL -1 , 10 - 500μL mL -1 and 1 -240μL mL -1 respectively. The method was validated according to ICH guidelines. The method described is simple, sensitive, rugged, reliable and reproducible for the quantitation of methanol, ethanol and isopropyl levels from herbal formulations and extracts and their levels are found to be within the ICH limits. An in vitro procedure for rapid multiplication of medicinally important plant Desmodium gangeticum (L.) DC. (Fabaceae), has been developed using cotyledonary nodal explant. An average of 9.2 shoots per explant were obtained by culturing cotyledonary nodal explaint on Murashige and Skoog's medium containing 8.8 μM BAP and 21.2 μM NAA, in combination, within 28 days. These shoots were rooted on half strength MS medium supplemented with IAA 17.1 μM. Rooted plantlets were hardened using 1:1:1 mixture of soil, river sand and vermiculite under green house conditions. Two simple and accurate methods to determine Phyllanthin (PTN) and Hypophyllanthin (HTN) in herbal dosage forms containing Phyllanthus niruri extract, were developed using Zero order first derivative spectrophotometry and reversed-phase liquid chromatography (LC). PTN and HTN in herbal preparations (tablets) were quantitated using the Zero order first derivative responses at 259.2 nm for PTN and 252.4 nm for HTN in spectra of their solution in methanol. The calibration curves were linear with correlation coefficient, r = 0.9983 for PTN and 0.9977 for HTN in the concentration range of 10 to 50 pg/mL for PTN and 4 to 20 pg/mL for HTN. 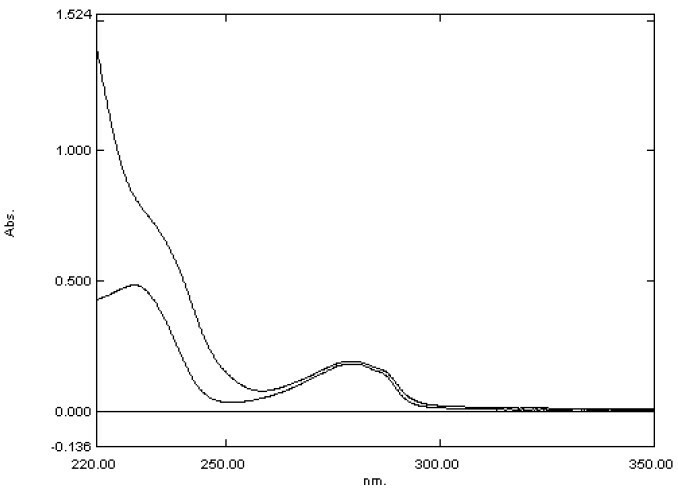 In the LC method, analysis was performed on a Phenomenex C-18 column (250 mm x 4.6 mm ID, 5 pm particle size), with isocratic elution using a mixture of tetrahydrofuran: water: acetonitrile in the ratio of 10:50:40 v/v/v at flow rate of 1 mL/min with UV detection at 230 nm. Both drugs were well resolved on the stationary phase, and the retention times were 16.05 minutes for PTN and 17.61 minutes for HTN. The calibration curves were linear (r = 0.9978 for PTN and 0.9996 for HTN) in the concentration range 10-100μg/mL for PTN and 5-50μg/mL for HTN. Both methods were validated, and the results were compared statistically. They were found to be accurate, precise, and specific. The methods were successfully applied to the estimation of PTN and HTN in herbal formulation containing Phyllanthus niruri extract. Terminalia arjuna (Arjuna), belonging to family combretaceae, grows along the streams or rivers and often in the shallow streambeds and riverbeds in central India. It has been considered by the Ayurvedic physicians as well as by the modern practitioners as a cardiac tonic. Clinical evaluation indicated that it has been found beneficial in the treatment of coronary artery disease, heart failure, and possibly hypercholesterolemia. It has also been found to possess antibacterial, antimutagenic and antioxidant activities. Demand for T. arjuna bark, both in India and abroad has been increasing rapidly for over a decade. About 95 percent of the requirement is met from the wild and collected in a pattern that is not concomitant with sustainable harvesting practices. The quality of the bark is directly dependent on harvesting technique and time. There is also a clear relationship between the part of the plant harvested, harvesting method used, and the impact of these on the plant. 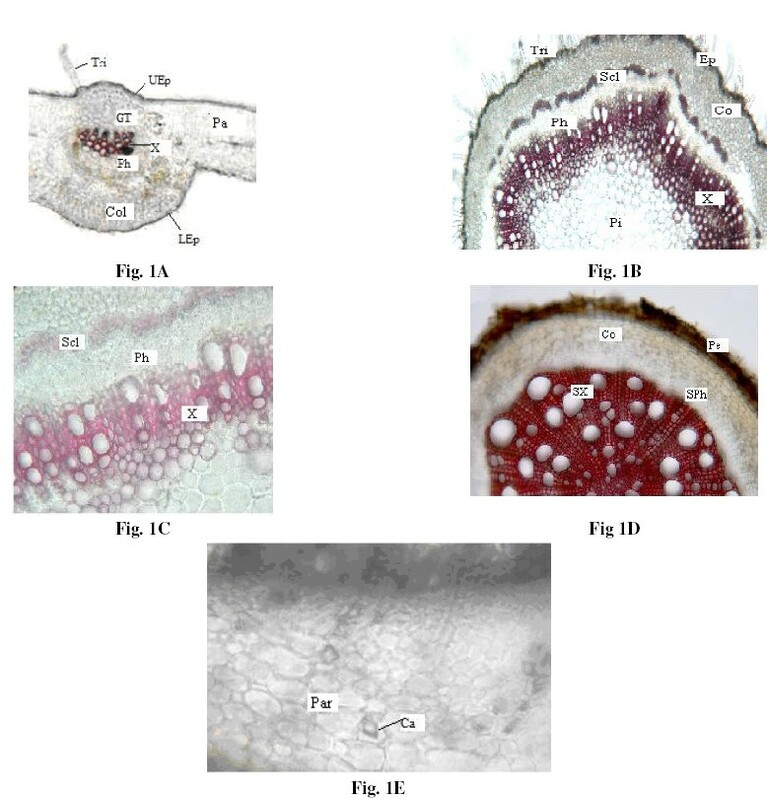 Keeping above into consideration it has been planned to carry out systematic study on phytochemical investigation of Arjuna bark collected from various parts of the tree at different harvesting time. The bark samples were analyzed for tannin and oxalic acid. The tannin and oxalic acid content varied from 6.75 to 14.82 % and 7.66 to 20.05 % respectively in various samples of T. arjuna bark collected from various places of Madhya Pradesh. The middle-aged trees having GBH around 130 cm were found to contain more amount of tannin. The study gives important information to obtain better quality of T. arjuna bark on sustainable basis. The Samburu are a marginalized nomadic people who have no access to conventional medical services. The Samburu therefore depend on traditional medical practice and medicinal plants for most of their medicare. The medicinal plants used have not been tested for efficacy especially on diarrhoreal diseases which are endemic in the community. This study evaluated plants commonly used for the treatment of diarrhoea in-vitro for antimicrobial activity against standard Gram positive and Gram negative bacteria. Results obtained show that the zones of inhibition for the active plants ranged between 16mm to 36.33mm. The MICs of the most active plants ranged from 0.9375 mg/50μl to7.5 mg/50μl. The MBCs ranged between 0.9375 mg/50μ to 7.5 mg/50μ. These results were significant at p< 0.01. 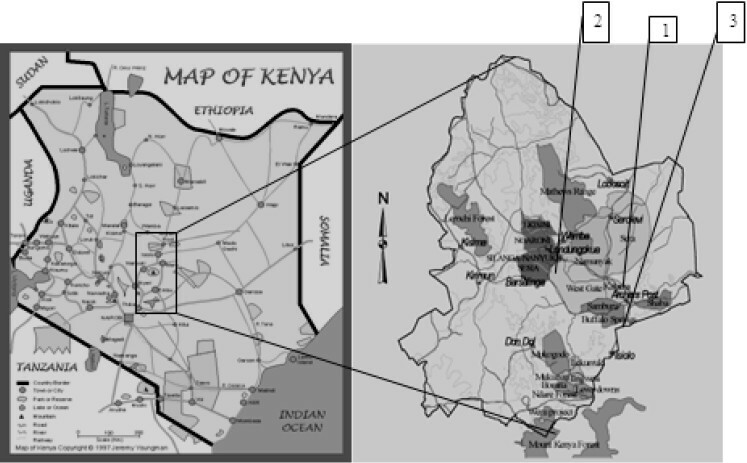 The findings show that most of the medicinal plants used by the Samburu community have significant activity against E.coli (Acacia nilotica- 21.66 mm) S. typhi (Acacia horrida- 19mm) and Pseudomonas aeruginosa (Cordia monoica- 36.33 mm) which are human pathogens especially Escherichia coli and Salmonella typhi which cause diarrhoea. This paper deals with the detailed pharmacognostical evaluation of the crude drug Phyllanthus reticulatus Poir. (Euphrobiaceae). Morphoanatomy of the entire plant have been studied with the aim to aid pharmacognostic and taxonomic species identification using light and confocal microscopy, WHO recommended physico-chemical determinations and authentic phytochemical procedures. The physico-chemical, morphological and histological parameters presented in this paper may be proposed as parameters to establish the authenticity of P. reticulatus and can possibly help to differentiate the drug from its other species.